What Do Oreo, Mondelez, and Wilmar Have to Do with Orangutans? Did you know that Oreo cookies are linked to deforestation and impact the lives of those that call the forest home — including orangutans? 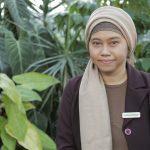 My name is Annisa Rahmawaiti, and I am a forest campaigner at Greenpeace Indonesia. I’ve dedicated my whole life to protecting our rainforests, yet many companies are complicit in razing them to the ground. The deforestation here in Indonesia is alarming. Much of it happens to make way for palm oil, which is then used to make products like cookies, chocolate, and shampoo. It’s sad and painful to see. But my colleagues and I believe there’s still time to protect our natural world. Forests are the lungs of our planet, our biggest defense against climate change, and I won’t stop until our rainforests are free from deforestation. So let me tell you about the ‘world-famous’ cookie Oreo. Many of you might love the taste of the soft vanilla cream combined with the crunchy chocolate biscuit. But did you know these cookies are linked to deforestation and impact the lives of those that call the forest home, including orangutans? What? Oreo cookies are connected to the suffering of orangutans? You’re kidding! A Greenpeace International investigation discovered that much of the palm oil Mondelez uses is produced by companies that are trashing the forest and wrecking orangutan habitat, pushing these beautiful and intelligent creatures to the brink of extinction. They’re literally dying for a cookie. It’s heartbreaking. 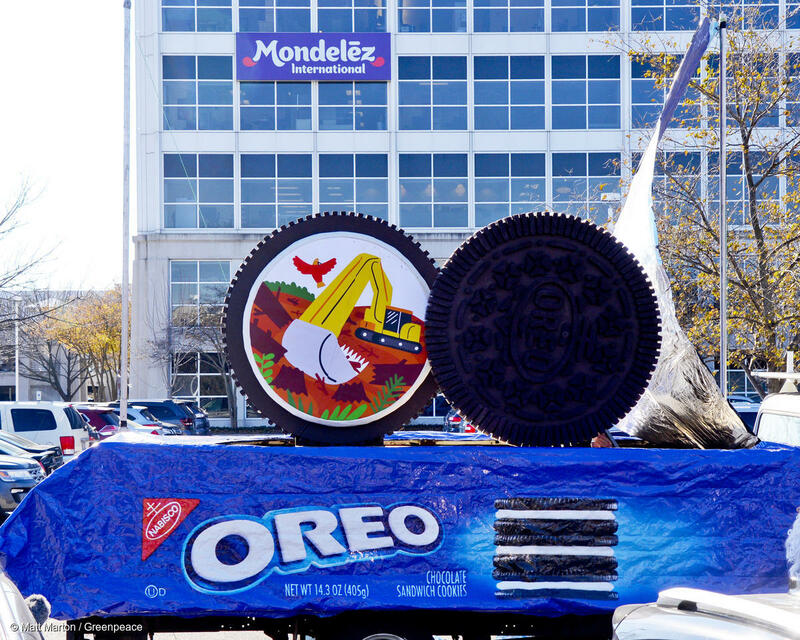 This is why Greenpeace US activists delivered a giant Forest Destruction flavor cookie to Mondelez, the maker of Oreo, at its global HQ near Chicago, to tell them to STOP buying dirty palm oil from rainforest destroyers. 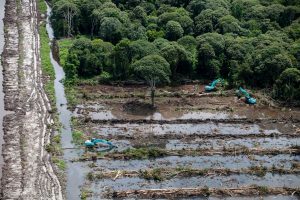 Almost 10 years ago Mondelez promised to eliminate forest destruction and human rights abuses from their supply chains by 2020. But Mondelez is still using palm oil from rainforest destroyers. Our new mapping analysis discovered that between 2015 and 2017, 22 of its palm oil suppliers cleared over 70,000 hectares of rainforest – an area bigger than the city of Chicago. Almost 25,000 hectares of that, was orangutan habitat. Mondelez promises to offer consumers ‘snacking made right’. But there is nothing right about palm oil that’s produced by killing orangutans and fuelling climate change. Mondelez gets much of this dirty palm oil from Wilmar International – the biggest and dirtiest palm oil trader in the world. 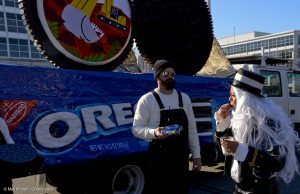 Greenpeace activists unveiled a new “Deforestation Flavor” of Oreo cookies at the global headquarters of one of the world’s largest snack food companies, Mondelēz International, the brand’s parent company. Mondelez has a responsibility to protect rainforests. It must keep its promise and cut Wilmar off until it can prove its palm oil is clean. And then other brands could follow their lead. Together we have the power to save Indonesian rainforests, but I need you. 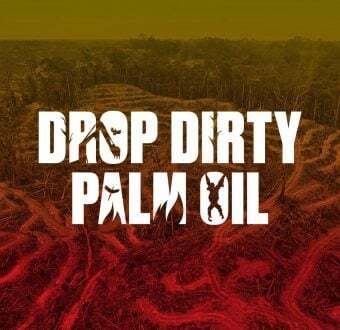 Will you help us make this campaign as big as possible, so Mondelez has no choice but to drop Wilmar and stop using palm oil connected to forest destruction? It’s not only Mondelez with it’s ‘world-famous’ Oreo that needs to change, but the whole industry. And I won’t stop until this happens. Palm oil can be produced without destroying rainforests, threatening wildlife and violating human rights. My mother always said: ‘Don’t lose hope. If you are persistent, if you know what you want, everything will come to you.’ And I truly believe this. So let’s clean up this industry once and for all. Add your name in the fight to protect Indonesia forest here. Senior Forest Campaigner at Greenpeace Southeast Asia, Indonesia.